Comparing sales performance this period vs. the same period last year is a fairly standard metric. 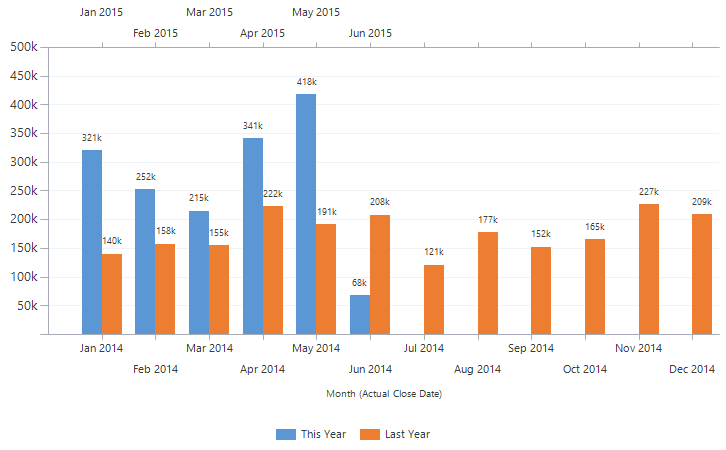 However, to create a chart that compares the period this year, with last years in the same date range can be tricky. For example, today is June 21st. I want to see my actual sales for this year to date, compared to my actual sales last year, until June 21st. Or Year to Date vs. Last Year to Date (YTD vs. LYTD). Or maybe I want to compare my sales this year and last year by month. In this post I will detail how I created both of these charts. Before I start to create the chart, I need to get some components ready first. Name it “Won Opportunities: This And Last Year.” Always use this view with the charts in this post. 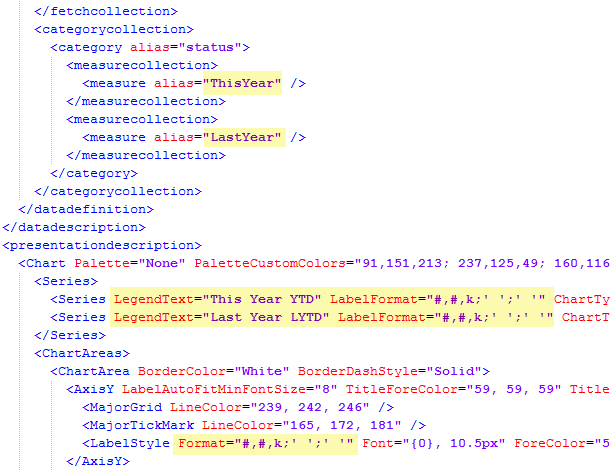 After saving it, keep Advanced Find open and use it to create the fetchxml filters we need to modify the chart xml with. Create the following filters and download the fetchxml. You can download the fetchxml without saving the View first. Using the Older Than X Years will make sure we only get the LYTD date range for the won opportunities. Note: Are you on a version earlier than CRM2015, you can use “Older Than X Months”, with X being 12, and get the same result. Time to open up the chart editor. Save a chart similar to the settings here. The two series for actual revenue, is what will be modified to YTD and LYTD using the filters we just downloaded from Advanced Find. Now the chart xml is ready to export and we can have some fun! The two attributes for the actual value series will need to be edited so they use the filters we just downloaded. Here is the fetchcollection with the additions made and the filters downloaded from Advanced Find highlighted in yellow. Created link-entity outer joins so the series only includes the filtered data. Added the YTD and LYTD filters downloaded from Advanced Find. Renamed the aliases from _CRMAutoGen_aggregate_column_Num_0 or similar to more sensible names. If renaming the aliases, remember to update them in the categorycollection too. The categorycollection is where you can adjust if YTD or LYTD should come first. In this example YTD comes first. The new formatting is designed to show amounts in the thousands with negative and zero values suppressed. See this post for details on chart labels and formatting. Import the XML and this should be your result. Here is the chart and we can see how our performance is compared to the same period last year. 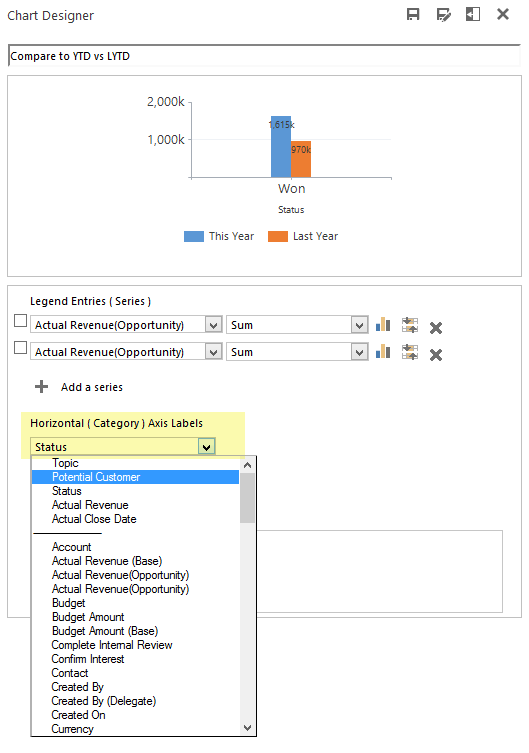 If you would like to see the data grouped by something else, such as customer or owner, you can open the editor and change the category. Just keep in mind that if you make any changes to the legend entries you will lose your xml customizations. For better insights on our sales development, we can group the sales by month instead. 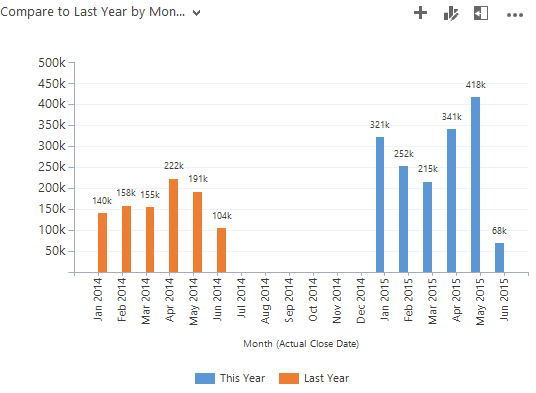 Start with the chart we just made and use the editor to change the groupby to Actual Close Date and Month. Click Save As and save the chart under a different name. Now we see the same data spread out per month instead. What I would like to do is include all of last years data and then have the month columns next to each other, so March of this year is next March of last year, etc. In short, what I will do is remove the Older-Than-1-Year filter so we get all of last year. Next I will split the data onto two separate X axes. One for each year and set the chart to display them in sync with each other so the months line up. Note: We are working with data by month. If data points are missing for a certain month, that month will not be included. For this chart, we are relying on having 12 data points for each year. If you do not have a data point for each of the past months, then use dummy records to ensure a data point exists for the missing months. These can be of zero value and will not interfere with the calculations. You do not need records for future months. First remove the “older than” clause in the fetchcollection. Now scroll down and add the secondary X axis. Both in the Series and Axis section. I added XAxisType=”Secondary” to the series for this year to indicate which series should go on the secondary X axis. The AxisX2 section is identical to AxisX except for the “2” so you can copy it and add the number. 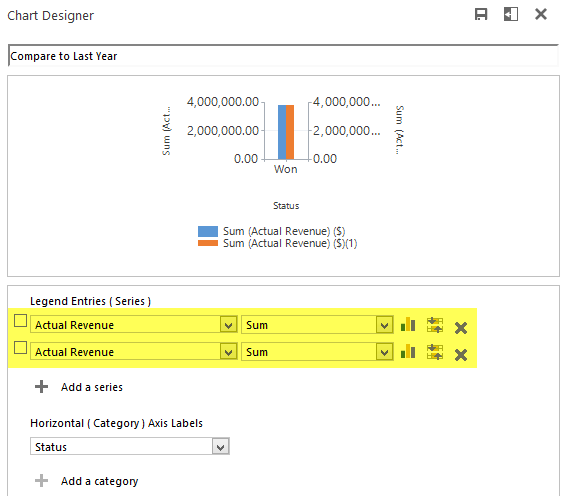 Import the chart xml back into MS Dynamics CRM. Notice that the secondary X axis has been added to the top of the chart. The blue columns are actually bound to the top (secondary axis) and the orange are on the bottom axis. Next step is to make the two axes overlap so it is easy to compare a month this year, to the same month last year. We have 24 data points. One for each month of the two years. The series for last year is displayed on Axis 1 and should show points 0 – 12 (Jan-Dec of 2014). Axis 2 has the data for this year and should show points 12-24 (Jan-Dec of 2015). To achieve that, I add Minimum and Maximum values to each axis so they are aligned. Here are the chart xml axis edits. IntervalOffset=”1″ is added so the axis does not show the zero value (i.e. Dec 2014 on the 2015 axis). 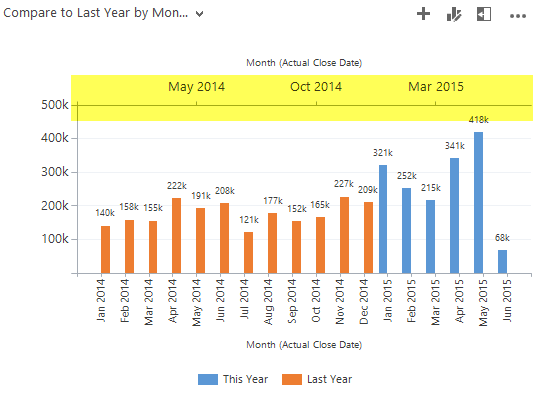 Interval=”1″ is added to make the intervals consistent between the two axes and show every month. Notice the maximums are set to 12.5 and 24.5. That is to make sure the data for the last month is displayed in full. If set to 12 and 24 only half the column would display. Import the xml and this should be the final result. The chart type on Last Year can be changed to Line, ChartType=”Line”, to get this result. As always, hope you enjoyed the post and found something useful. Please follow me on Twitter Follow @crmchartguy or sign up for the newsletter to be alerted on new posts. Hi, this works great but my issue is that I have no data for Jan and Feb 2017, but i do for Jan and Feb 2018, so the months on the x and x2 axis labels are not aligned properly. I tried changing the min/max but cannot get it to show properly. Any help would be appreciated. That’s a challenge with this chart. You do need data for each month. It is possible to create some dummy records with no value to even it out. I.e. an opportunity with 0 est. rev. Thanks for the quick response! I will do that. Hi Ulrik – can you help guide me to setting something like this up for counting the # of opportunities created per month for this year and last year? 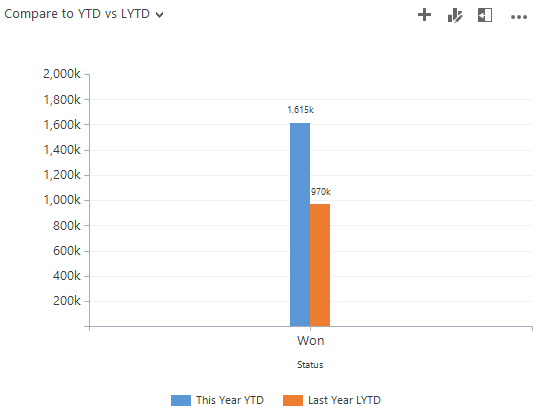 LYTD, YTD – is it similar? Yes, it would be similar. I think you’d just need to use the countcolumn aggregate instead. Hello – I have set up a chart to compare 2017 and 2018 annual spend by event category. My “last year” data is pulling the correct data. The data for “this year” is pulling numbers from both last year and this year? Would you have any idea why that would happen? I’ve tried modifying the filter conditions in the XML with no luck. Please let me know. Thanks. Thank you for sharing the wealth of knowledge. You are an inspiration to the CRM community and a rare gem to the CRM world. I did follow your Instructions and it was helpful in creating a chart that I needed. After overlapping X Axes, how to I change the name of the axis text (category name/axis labels). I did try using Format=”MMM” in the LabelStyle node and it did not work. Basically, I would like to keep the calendar months and remove the year. I appreciate your kind help with this. That type of formatting is not supported on an axis unfortunately. It would have been great. Hello Ulrik, thank you very much for your contribution to the CRM community! I followed your steps and it works properly but I do have an issue with the second axis, both axes are not on the same level Axis 1 max is 160k while Axis 2 max is 100k so Axis 2 is above Axis one when in reality it is supposed to be the opposite. Anny thoughts ? Hi Mat. consider adding a Max property to both axes. That way you can hard set both both axes at 160k. You lose some dynamic adjustment of the axes, but at least they will match. I tried doing the same thing to compare Quarters but I couldnt make it work, do you think it is possible ? And I did it aswell to comprare This month to last year same month example March 2019 vs March 2018, it works but the final chart is not pretty to look, like X is getting over X2 when interval and such values are the same ? Hi Ulrik and thank you very much for your help! I have one issue, Axis 1 max is 160k when the record is 140k and Axis 2 max is 100k when the record is 99k so axis 2 is above axis1 when it is supposed to be the opposite, any idea? It is always fun to recreate the charts you talk about and customize them. We use the Recruit version of MS CRM, so there’s not always a direct correlation because we focus on enrollment numbers rather than revenue. But I recreated the month comparison with a count column aggregate and it is working great! Thanks so much! Do you know if there would be a way to subtract canceled opportunities from a chart like this? I think if it wasn’t comparing to last year, I could use the second x axis reversed and underneath the first x axis to see students that canceled during that month. But I would need four x axes to do that here, right? Am I overthinking it? Can you think of any other way to subtract cancelled students from a chart of applicants, for instance?